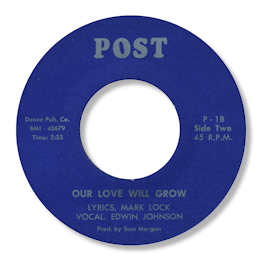 Our Love Will Grow from the terminally obscure Edwin Johnson is a version of a song also recorded by Dave Carter. Johnson’s cut is less exuberant, more carefully considered but still hits hard enough for purists like me. He has a nice tone and a good range as well. The backing is neat and tidy too. Judging by the flip, which is strong rocking R & B, this might even be the original recording. Could this 45 come from New York like the Carter disc? It isn't the New Orleans Post label that's for sure. UPDATE ~ Some time ago my great friend Greg Burgess has written about another Edwin Johnson release, which I've finally found on one of my shelves. 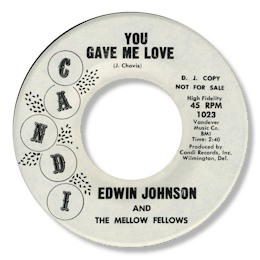 As you can see "You Gave Me Love" is on the Candi label from Wilmington, DE. Sadly the track itself is none too good, nearer garage band music than deep soul I'd say. But is it the same artist? Note ~ The flip to the Candi 45 is by Silas Phifer. I Lost My Linda / Mis-ter Night (Candi 1028). I'm sure this is the same guy as Candi 1023 (shown above). Martin comments that "The A-side leans slightly more towards deep soul (despite the unpromosing title of "I Lost, My Linda"). The flip is an early Northern dancer called "Mis-Ter Night", and I have it dated at 1962. As I said, it doesn't sound much like either of your two." Very kind of Martin to let me know about this other 45. Thanks to my friend Tom de Jong for the suggestion and to Greg Burgess for more very diligent research.